Gourmet fancy cake recipes come in many packages of all sizes and shapes, from fancy wedding cakes to gourmet chocolate truffle cakes and crumbly New York Crumb cakes. Fancy cake recipes are often made with simple ingredients like chocolate, vanilla and coffee, but become masterpieces with candies, added liqueurs, or fresh fruit. 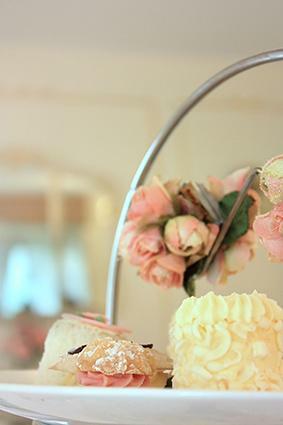 Fancy cakes are often deceptively so, boasting an appearance that seems like it would take hours. However, the home gourmet chef can make gourmet and fancy cakes at home. This buttery tea-time pound cake, made with pure Dutch chocolate, tastes perfect served with piping hot coffee or tea. Garnish it with a dollop of whipped cream and a handful of fresh berries. Preheat oven to 350 degrees F. Grease a clean cake pan and lightly dust with flour. Bring the water to a boil. Stir in Dutch-processed chocolate until the powder dissolves. Allow the chocolate to cool. Sift flour, sugar, salt and baking powder. Slowly add the butter until all ingredients are blended. Whisk the eggs and vanilla into the cooled chocolate paste. On medium speed, begin mixing the chocolate paste into the butter mixture, a little at a time. Pour cake mixture into a cake pan and bake for 60 minutes. Remove pound cake and allow it to cool on a wire rack for approximately 15 minutes. 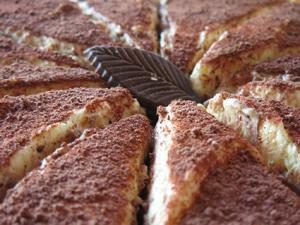 Tiramisu is a dreamy Italian cake made with mascarpone, coffee, liqueur, cream, sugar and dark chocolate. Traditionally, it is made with lady fingers or in some cases a sponge cake. This fancy tiramisu cake recipe is made with a moist, buttery cake batter rather than with traditional lady fingers. Preheat oven to 375 degrees F. Grease two 9-inch cake pans and line with parchment paper. In a medium-sized bowl, sift the dry ingredients together and set aside. Slowly add one egg at a time and beat until the mixture is blended. On low speed, alternate beating in the dry ingredients and the buttermilk; continue beating until the batter is light and aerated. Pour batter into cake pans and bake for 25 minutes or until light golden brown. Remove pans and allow them to cool on a wire rack for 10 minutes. In a small saucepan, add the coffee, sugar and liqueur and simmer over medium heat for five minutes. Remove from heat and stir in espresso extract. Allow espresso syrup to cool to room temperature. Combine the mascarpone, sugar, vanilla and liqueur and mix until smooth. In a separate bowl, whip up the heavy cream until stiff peaks are formed. Add one teaspoon of sugar, if desired. Poke holes with a toothpick along the surface of the first cake layer. Spread one-half of the espresso syrup over the cake layer. Spread approximately one-third of the mascarpone frosting over the cake layer and sprinkle with chocolate shavings. Assemble the second layer of cake and poke holes along the surface. Pour remaining espresso syrup over the layer. Frost the cake with the remaining mascarpone topping and dust the surface with cocoa powder. Allow the cake to settle and chill overnight. No fancy cake is complete without a dramatic culinary presentation. Present your cake well to show off the time you've taken with it. The art of cake presentation can encompass fancy cake decorating techniques and supplies, or it can be as effortless as applying a few simple, yet whimsical ideas. Garnish your cake with shaved chocolate curls or dust it with cocoa powder or confetioners' sugar; with a little imagination, you can have an elegant cake presentation.